18 სექტემბერს, 18:00 საათზე ჩინგიზმა მოაწყო მისი სამუშაო სივრცის ღია კარის დღე გეოეარის რეზიდენციაში. მან წარადგინა თავისი ნამუშევრები და ისაუბრა მათი განვითარების შესახებ. ხელოვანმა, ასევე, წაიკითხა მისი ბოლო დროის ჩანაწერები. On September 18, at 18:00 (c)HINGIZ opened the doors of his working space at the GeoAIR residency. He presented his previous works and talked about their development.The artist also read his recent writings. Events happen today which appear unpredictable at first for some and predictable for others, as do changes to the geopolitical situation around the planet. Such changes come about so fast that art and artists cannot respond with the immediacy we are accustomed to in other fields, such as journalism. Global changes in human life, through technological, social and political aspects, appear in all spheres of peoples’ activities. Culture and art cannot remain unaffected both in terms of their format or strategic point of view. If we compare contemporary art with the events of real life, of course art is not able to strike us as being data about current events. Then we must ask the question, what is the role of contemporary art today? Is its’ role to affect people in the same way as terrorist acts or natural disasters? I think not. Art has changed its format quite some time ago. Today analytical, philosophical, social and political aspects dominate in it. However, art is not journalism which clearly relates various current events in a direct way. At the same time, it is not merely the means for home decoration, or just the ideological instrument of governments. Contemporary art strategically analyzes reality and conceptually formulates the position of that very artist-thinker. It distinguishes joy and pain, communicates with a person in a different format, while raising not only daily issues, but also very intimate and profound spiritual experiences. Research conducted by artists cannot answer all these questions, but they can visually and scientifically form them. This allows the creation of a platform for discourse, or criticism of preconceived concrete ideas. Therefore, contemporary art is closely linked with criticism, while critique appears to be its logical consequence. Artworks are not completed by the author; the process is an ongoing one. The work, artwork, might never be complete in the way that work can be complete, that is to say the production of commodities or provision of services as work. The power of art and its’ relevance is its own life expectancy in the cultural world. True culture transforms people who created it. If artworks are not completed by the author, then I would suggest that they can reach a state of completion through the eyes of the audience, and therefore art can be transformative for the creators of the work, the artists, and for the audience who view it. ჩინგიზი დაიბადა 1964 წელს ბაქოში, აზერბაიჯანი. ის ცხოვრობს და მუშაობს ბაქოში. ჩინგიზმა 1991 წელს დაამთავრა სახვითი ხელოვნების სამაგისტრო პროგრამა აზერბაიჯანის სახვითი ხელოვნების სახელმწიფო უნივერსიტეტში. 1986 წლიდან ის მუშაობს როგორც კონცეპტუალური ხელოვანი და იყენებს სკულპტურებს, ნახატებს, გრაფიკებს, ფოტოს, ვიდეოს, ინსტალაციებს, პერფორმანსებს, დიზაინს, პროზასა და პოეზიას, ფილოსოფიას და ა.შ. მისი ცნობილი ნამუშევრები უკავშირდება პროექტებს, რომლებშიც გამოკვლეულია ურბანული, სოციალური, პოლიტიკური და ისტორიული საკითხები. 1996 წელს, ბაქოში მან დაარსა "ARTS etc..." თანამედროვე კულტურის ცენტრი. მოგვიანებით, ასევე, იყო რამდენიმე ადგილობრივი და საერთაშორისო პროექტის კურატორი. 1996 წლიდან ის არის აზერბაიჯანის მხატვართა კავშირის წევრი. ხშირად, ის არჩეული იქნა საერთაშორისო კულტურული ორგანიზაციების მრჩეველად და საბჭოს წევრად, რომელთა შორისაცაა: აღმოსავლეთის პარტნიორობის კულტურის პროგრამა; ECF (ევროპის კულტურის ფონდი, ამსტერდამი) STEP Beyond პროგრამის მრჩეველი კავკასიის ქვეყნებისათვის; ბაქოში, ღია საზოგადოების ინსტიტუტის ხელისშეწყობის ფონდის ექსპერტი; საფრანგეთში, CORD სახელოვნებო ჟურნალის სარედაქციო საბჭო; ბაქოში, ღია საზოგადოების ინსტიტუტის ხელისშეწყობის ფონდის საბჭოს წევრი. ჩინგიზის ნამუშევრები ინახება სხვადასხვა სახელოვნებო კოლექციებში, როგორც კერძო, ასევე, მუზეუმებში, როგორებიცაა: თანამედროვე ხელოვნების მუზეუმი ბაქოში (აზერბაიჯანი); ვაჰიდ ქუროს კოლექცია (აშშ-შვეიცარია); მისი ნამუშევრები, ასევე, წარმოდგენილია კოლექციებში რუსეთში, უკრაინაში, ვიეტნამში, აშშ-ში, დიდ ბრიტანეთში, ავსტრიაში, იტალიაში, ესტონეთში, საფრანგეთში, პოლონეთში, ფინეთში, ნორვეგიაში, შვეიცარიაში, დომინიკელთა რესპუბლიკაში, ყირგიზეთსა და ირანში. რეზიდენციას ფინანსურად მხარს უჭერს ღია საზოგადოების ინსტიტუტის, ხელოვნებისა და კულტურის ქსელური პროგრამა. CHINGIZ was born in Baku, Azerbaijan in 1964. Lives and works in Baku. CHINGIZ graduated with a degree MFA from Azerbaijan State University of Fine Arts in 1991. Since 1986 he worked as a conceptual artist with sculptures, paintings, graphics, photo, video, installations, performance, design, writing & poems, philosophy and etc. His characteristic work includes projects that researches urban, social, political and historical issues. 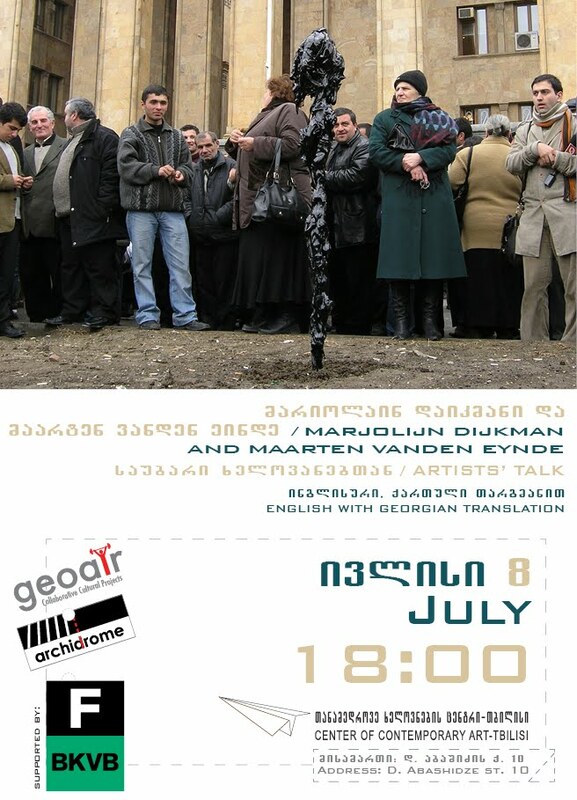 In 1996 he established in Baku "ARTS etc..." Centre for Contemporary Culture. Later he has curated few art projects, both, locally and internationally. Since 1996 he is a member of The Union of Azerbaijan Artists. Many times he was chosen as a board member and adviser for various international cultural organizations such as Eastern Partnership Culture Program, nominated by ECF STEP beyond adviser for the Caucasus countries, ECF (European Cultural Foundation), Amsterdam; Expert, Open Society Institute Assistance Foundation, Baku, Azerbaijan; The editorial board of the CORD art magazine, France; Board member, Open Society Institute Assistance Foundation, Baku, Azerbaijan. Art works of CHINGIZ are held in collections of different art collections, as private also in museums, such as: Museum of modern art in Baku, Azerbaijan; Vahid Kooros, USA-Switzerland; works are also represented in collections in Russia, Ukraine, Vietnam, USA, UK, Austria, Italy, Estonia, France, Poland, Finland, Norway, Switzerland, Dominican Republic, Kyrgyzstan, Iran. Residency stay is supported by Open Society Institute, Arts and Culture Network Program.